It finally happened to me. 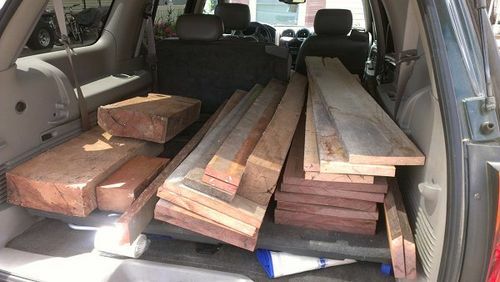 My Cousin, who lives in Mississippi, called and asked if I could use some wood – Can I ever :-)!!!!! I met him in Franklinton, LA (about half way to his house) and he had the back end of his pickup loaded! He had cut 3 1×12x10’ boards of Walnut (beautiful stuff) in half. His Dad purchased this wood from a local mill about 30 years ago and had it stored in his shed all that time. I ws afraid that it would be cupped, checked and mostly unusable – but it was flat relatively unchecked and beautiful! He also had 2 boards of Pecan, 2 boards of Red Oak, 2 boards of Red Cedar all measuring 1×10x5”and several large chucks of Walnut. Can I tell you how happy I am!!!! Someone is smiling down on you. woot ! looks like a whole bunch of fun ! congrats thats a very nice haul!! im so happy for you bill, well i guess this cancels out you coming this way, well the wood i had stored for you for turning will still be here if you ever do come this way, i cant wait to see what you start making with this new gloat, congrats friend….!!! I am always looking for these things, never find them. Great find. It couldn’t of happened to a better guy. Just think of the fun you will have thinking of what to do with it. And you know it’s dry. Congratulations on a very nice bit of luck. You are one fortunate guy Bill. You do realize that you are now obligated to make him a nice “thank you” gift from some of this wood? Most awesome…! Now, Whatcha gonna build first?